Terminalia spp., "Tropical Almond " and related species (Combretaceae). 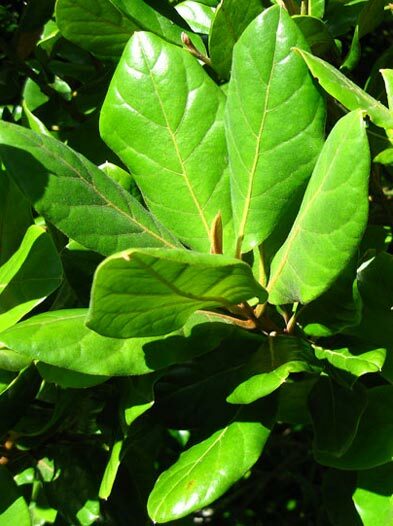 Rarotongan: Kavariki (Terminalia glabrata and related species. "Tropical Almonds", Combretaceae) Terminalia catappa, the pan-tropical "Tropical almond" species, is known as 'auari'i in Tahiti, and talie in Samoa and Tonga -- see the page for Proto C E Polynesian *Kaualiki for further information. This name seems to have originated in the Tahitian area not long before the settlement of Aotearoa, as in Tropical Polynesia it is confined to the Tuamotus and Mangaia (an island in the Southern Cooks group), where it refers to the indigenous species of the "tropical almond" group of trees, belonging to the genus Terminalia. The	name	has	also	gained currency in Rarotonga as an alternative to kauariki or kavariki for the Mangaian and introduced species of Terminalia. These are large trees, which in some island groups (e.g. Samoa) are important sources of timber. Arthur Whistler considers that the Eastern Polynesian T. glabrata and at least the Samoan form of the cosmopolitan T. catappa found on Savai'i may in fact be regional variants of the same species (Rainforest trees of Samoa, p.43). There is more information about these trees on the page for Proto Central Easter Polynesian *Kaualiki. The botanist G.P. Wilder, in his Flora or Rarotonga (1931), noted "tarairi" [sic] as a local name for the shrub Myrsine cheesmanii. However noone else has made this link; the Cook Islands database reports just one local name for this plant, Ka'ika Makatea (the makatea is the raised skirt of dead coral around the coast of some islands) on the Island of Miti'āro, where it is particularly common. This species is endemic to the Southern Cook Islands; it grows to about 3 m. high and has tiny flowers on the brittle branches, followed by small, round, purple berries. It is not particularly reminiscent of the taraire, either Mangaian or Aotearoan. 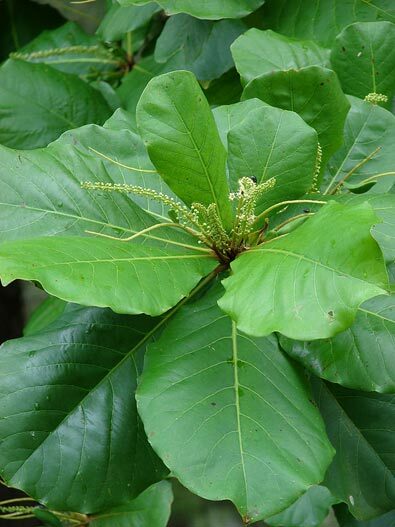 With its commanding stature and large, glossy leaves, it is not difficult to imagine why the early Polynesian settlers may have identifed this tree with the Terminalia species they had left behind in their old homeland. As we were walking along a track in the Hakirimata forest (between Ngaruawahia and Huntly) a few years ago, a Hawaiian friend suddenly stopped, pointed to a large tree a few metres away, and said “Oh, do you have avocados here, too?” Well, of course, we do, but not in the Hakarimata forest! The tree she had spotted was the taraire (Beilschmiedia tarairi), which is indeed a relative of the avocado, a fellow member of the laurel family (and of a different order of plants from the taraire’s tropical namesakes). It’s about this time of the year that the berries are ripening (the “season” is roughly from October to May), much to the delight of the kereru. The oval berries are nothing like the size of the avocado, although they are quite conspicuous – shiny dark purple when fully ripe, and a little over 3 cm. long. As they are ripening they appear to be a light blue colour, because of the bloom which covers them at that stage. The leaves are very handsome, oval-shaped (often rather oblong), about 15 cm. wide by 5 or 6 cm. broad on stalks a centimetre or more long, and a shiny, light-green colour with conspicuous veins covered with a red-brown tomentum; the underside of the leaf is a much lighter green with a matt finish (although the veins are also quite conspicuously clothed with the tomentum – so for that matter are the leaf-stalks, young side-branches and flower stalks). In the forest the tree will grow to over 20 m. high with a straight trunk up to a metre across. In the forest it is (of necessity) quite compact, but out in the open its branches will spread to make it a very good shade tree. Taraire are closely associated with kauri (which is probably why they are still to be found in parts of the Hakarimatas), but away from the kauri they have gourmet tastes, preferring rather better than average land, which has caused them to have become fairly rare in their preferred habitat, as much of the land with the largest concentrations of taraire has been cleared for pastoral farming and agriculture. Kiwifruit farmers probably aren’t very fond of them, because, along with a number of other native and exotic trees, they are hosts of the “greedy scale crawler” (Hemiberlesia rapax), which can be carried by the wind into the orchards at the appropriate time in their life cycle (the danger is greatest in November/December and March/April). On the other hand, they are very important for the survival of one of our native orchids, Danhatchia australis, which is parasitic on a puffball fungus which in turn has to tap into the rootlets of the taraire to provide for itself and its dependent orchid. They are a northern tree, with the southern limit of their natural range stretching from around Raglan across to the East Coast. It’s very likely that, like the hinau, forest-grown taraire were managed by Maori in pre-Treaty times. The phrase papa taraire indicates a an area where Taraire are (or were) concentrated, and it’s highly likely that quite a few of the trees in such areas were actually planted or at least given a little extra help to establish themselves. They are one of the New Zealand native trees that might well grow sufficiently fast to be worth considering as a plantation tree. They have a good, light timber which is useful for furniture and flooring – however it does have to be treated to protect it from attacks by borer, which enjoy its wood as much as the pigeons enjoy the fruit. It was a “people food”, too, and I can remember as a teenager enthusiastically eating ripe taraire berries in the bush (they can’t compete with kahikatea droops for taste and sweetness, though). It was the kernel that was the part used for serious eating by the Maori. The kernels were prepared by heat-treating them by baking, boiling, steaming or roasting them and then mashing the softened remains. They were a good source of carbohydrate and probably various minerals, protein, and whatever vitamins could survive the heating process. From the plant’s point of view, processing by large birds able to swallow the seeds whole (of which only the kereru and kaka remain) was more advantageous. Their digestive systems clean off the flesh nicely and enable the seeds to germinate quickly in new locations. However, if there are no piles of them discarded by roosting pigeons at hand, they’ll still germinate easily if you gather them before they’ve dried out and wash all the flesh off before sowing them. R.H. Blank et al., “Invasion of greedy scale crawlers (Hemiberlesia rapax) onto kiwifruit from taraire trees”, NZ Entomologist, Volume 10, 1987. E.D. Hatch, “The distribution of Danhatchia australis”, NZ Native Orchid Group Journal No. 63, 1997. J.T. Salmon, The Native Trees of NZ (Revised Edition), Auckland: Reed, 1996. There are also useful articles on taraire on the NZPCN and Auckland University biological sciences web sites. Check the Bibliography for additional material on taraire and other New Zealand and tropical plants. Photographs: John Barkla, NZPCN (NZ Taraire), Forest and Kim Starr, Starr Environmental, Maui, Hawaii (Terminalia catappa).